← Should Auld New Year’s Eve Gigs Be Forgot . . . Happy New Year From the DFFD Blog! The release of D.F.F.D. The band’s first album in two decades made many critics’ year-end lists in 2001, and without a doubt made our entire year. In fact, it was so damned good it sustains us still. A hot set at Little Steven’s Underground Garage Festival. 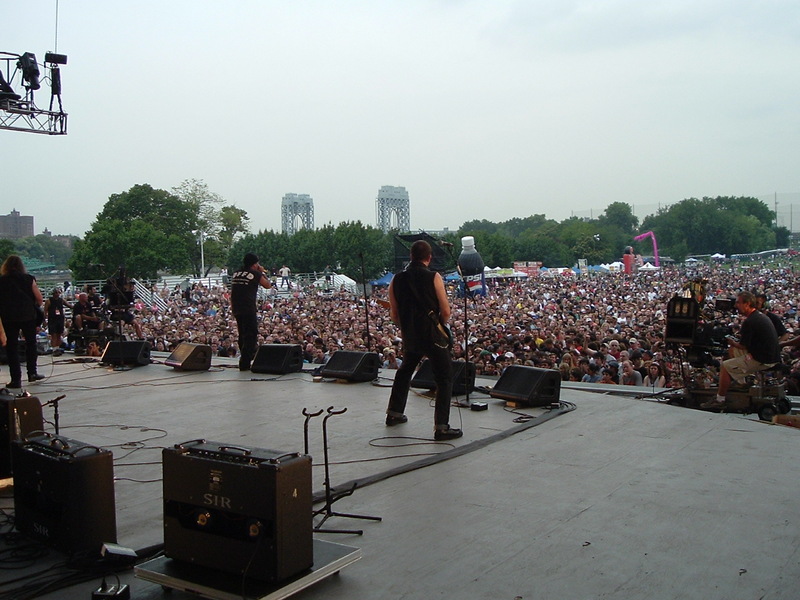 The boys wowed ’em in Randall’s Island (click to supersize the photo above). Spinning stage, humongous screen, large crowd, media frenzy — that’s how the ‘Tators team deserves to roll. Two memorable shows during CBGB’s last weekend. The last band standing pulls off a pair of fitting tributes to the punk rock palace. We just hope we weren’t also saying farewell to stateside shows by our heroes. We sign off hoping beyond hope for more such Dictators delights in the near future, but most of all we wish you — our fellow fans with the finest taste in music — the happiest and healthiest of new years. Talk to ya in ’10! My Top 10 Dictators Moments 2000-though 2009. 10. Seeing Ross play with the Brain Surgeons in two Wisconsin hotspots, Wisconsin Rapids and Beloit. Meeting my pal, fellow Wisconsin Dichead Steve Tully, & the Almighty Dawnowar at the Beloit gig. Yakking with Ross & Albert Bouchard, two musical icons in my rock and roll eyes. NYC, Providence, Cincy/Lexington, thanks to pal Salvi, and to my bride Judy. Hanging with fellow Dicheads Tully, Karen & John, Gene & Yo, Kris & Dawnowar. I treasure these moments. 7. The Dictators play on a flatbed trailer on the town square of Owensboro, Kentucky, @BBQ Fest. Just like a young Elvis! Manitoba is forbidden from swearing, but wins the bet when he’s successful. Seeing the band in the sweltering autograph tent, waiting for anybody to show up. Even us! A weird day, an even weirder set! bit with that last one. with Ross. BillyMarks doesn’t seem like a “no shoes, no shirt, no service” kind of place. 4. The brief, tough set @ Little Steven’s Under-ground Garage Festival @ Randall Island. HDM & Andy never look at each other. The Dictators get a 15 minute set, while poseur puffs The Strokes get an hour. Huh? The Stooges headline…and kill! 3. The Dictators headline the Las Vegas Shake-down in 2000, playing a wild set that included the debut of “Avenue A”. After seeing 40+ bands over three nights, the mighty Dics still blew our socks off! Wild catfights in the crowd, the floor was bowing beneath our feet from the crowd’s insanity. 2. The Final Friday of CBGB’s. We all (Salvi & I, Karen & John, Gene & Yo, & Dawnowar) meet @ Manitoba’s, chow down, and attend the gig. My first time inside our Mecca. I scream “Rock Or Die” into Russell Sic F*c’s mike. The Dics play a very good, though a bit rusty, set. Still, seeing as we thought we may never see them play again, it was awesome. But not nearly as awesome as…. 1. The Final Saturday of CBGB’s. Tully arrives in time for our Manitoba’s warmup, JP helps Salvi & I get in, The Dics lay down possibly the best set I’ve ever seen them play. Smiles all around the crowd, and on stage. The finale, with Tommy Ramone joining the band on lead vocals for a version of “Blitzkreig Bop” left me a bit misty eyed. After the show, Salvi got tossed out of CB’s for the sin of breaking off a piece of the chip board wall. It’s been over three years since this gig, and since I’ve seen The Dictators play. And if they never play in the USA again, I’m finally at peace with that. But here’s hoping we can all see them once again. Remember, HDM, Andy, Scott, Ross and JP…..
A rockin’ 2010 to all you Dicheads out there! Beautifully said, Robbie. This was the best thing I’ve read in 2010! -Was the 2nd Bowery Ballroom show this decade? If so, that was a killer show. Now for some speculation-the Continental is having a special guest next weekend for the reunion show. I spoke to Daniel Rey who stated he is performing with CJ Ramone. I should have asked him about MWK as JP Patterson stated they were discussing some MWK gigs. Hmm, what do you think, Karen, Sal? Terrific list, Adam. Thanks for reminding me of some great shows. I love the thought of Wild Kingdom guesting at the Continental but I have yet to hear anything that might lean that way. Ah, Manitoba has been confirmed as a special guest for the Continental reunion. Come on, we want MWK.